Double standards are human nature, but seem also to be evident among some of Egypt’s journalists. Consider these two articles from Ahram Online. “I heard a media personality saying that the president was holding talks with representatives of foreign companies while Alexandria was sinking. Speaking like that is totally unacceptable. We can’t deal with our problems this way,” he said, referring to TV host Khaled Abu Bakr who criticised him during the flooding in Alexandria. “Constructive criticism is the way to build a state with justice and freedom regardless of how strong it is or its nature or the person who is being criticised,” a statement issued by the syndicate read. Egypt’s Press Syndicate announced on Monday its solidarity with the Chamber of Audiovisual Media Industry’s (CAMI) decision to ban lawyer and Zamalek Club chairman Mortada Mansour from appearing on its TV channels. 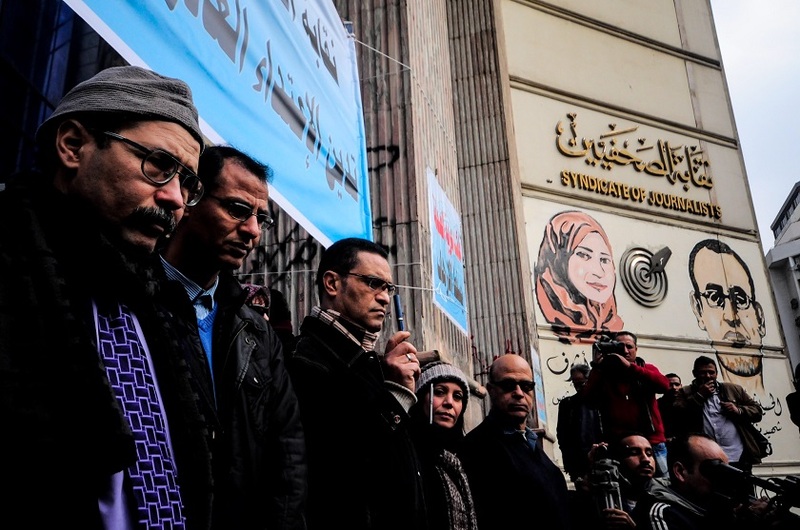 “We call on all journalists who are members of the syndicate to boycott any pressers held by Mansour as well as not report on any of his statements,” the syndicate said in a statement. For his part, Mansour decided late Monday to cancel the membership of several prominent journalists at Zamalek Sport’s Club in response to the CAMI and Press Syndicate decision. Mansour is certainly a firebrand, not averse to making controversial and often ill-founded statements. But what was his concern in this case? Mansour had accused El-Hadidy of intentionally not giving a voice to his son Ahmed Mortada Mansour while he was running for parliament last month. Mansour claimed that his son, now an MP, wanted to make a phone call on El-Hadidy’s show, which she refused while at the same time hosting his rival in the electoral race, Amr El-Shobaki. At issue, of course, is whether or not the accusation is true. The article gives no indication either way. But it appears contradictory for the syndicate to insist to the president on the right of free and open coverage, including criticism, when it calls for a media blackout against one who criticism them. Consult the Sermon on the Mount for more information.